Whether you are a professional or amateur photographer one thing you probably face often is where to shoot. Sometimes I get the urge to go out and shoot but I draw a blank on good photography spots. So I have a photography spot scouting process I follow. It is not actually a formal process, but more of a way to keep track of places I may want to shoot someday. You will need a few tools for this, but nothing too fancy is required. 1) A notepad. If you want to get high tech a tablet device such as an iPad works great. 2) A point and shoot camera. Again, nothing fancy required. Just a basic point and shoot or even your cell phone camera will do. You can either do this deliberately or just keep track as you go about your daily life. Or, better yet, do both. This is really simple. Take an hour or two on a weekend and just head out with the above tools in hand. Where you head will depend on what you like to shoot. Architecture? Head to your city’s downtown or try something different like and industrial area of town. Portraits? Just about anywhere will do. Landscapes? Pick a direction and take a drive. Location. Make sure you are specific enough that you will be able to find it again later. Angles and potential compositions. Where were you standing when it looked best? How might you frame it? What surrounding elements will you want to include in the image? Lighting. What direction does the subject face? Will sunrise lighting or sunset lighting be optimal for photographing it? What are the shadows like? Challenges. What potential problems might you encounter when you come back to photograph? Are there crowds? Will the leaves have lost all their leaves? Is there construction now that may be gone later? All the rest. If you think it will matter to your photograph make a note of it. Finally, take a few quick shots with the point and shoot just to give yourself something visual to come back to. Now you have a documentation of someplace you can come back to either when the mood to photograph strikes or when you have a client looking for a unique location. And as you build your list you will have a catalog of shoot locations to go to whenever the need arises. Before you get halfway through a shoot and realize you left the ISO on 1200 or white balance on tungsten it is a good idea to make is a part of your photo shoot habit to check and reset all your camera’s settings. To help me get my best shots I have come up with a short pre-photo shoot camera check list. These are all the things I need to quickly verify are as they should be for the shoot I am about to do and not as they were for the last time I was photographing. Your camera or specific needs may be a little different but this should be a good starting point for you to make a check list of your own. Anti-Shake (Stabilizer) On/Off – When shooting on a tripod it is a good practice to turn this feature off. So if the next shoot does not include a tripod make sure you turn it back on. Or vice versa. ISO Setting – You may not adjust this setting much depending on what and how you photograph, but check it to make sure it is set for the lighting condition of your current shoot. Manual / Auto Focus – You’ll notice if this is not set right pretty quickly, but helps to make it a habit to make sure it is where you need it to be. RAW/JPEG Setting – I rarely shoot anything other than RAW, but there is always that one time which could ruin the photo shoot the next day. Better to just check each time. Drive – This may be called something else on your camera, but it is where I set my bracketing and continuous shot settings which I change often. White Balance – Maybe you leave it on auto all the time, but if you ever alter this setting for various lighting conditions you’ll want it on your check list. Focus Area – This includes Wide, Spot or Local for the Sony Alpha 850 I shoot with, but whatever your camera calls it, it’s better to have it set where you need it before you start shooting. Clean the Lens – OK, so this is not a camera setting, but it is something you should definitely get in the habit of doing every time you go out to photograph. There you have it, eight quick and easy things to check every time you pick up your camera for a photo shoot. Making sure you have your settings right can save you a lot of time and trouble. Did I miss any that you have on your list? Let me know in the comments. Night time photography can be a bit tricky. It requires a bit more thought and equipment than daytime shooting. But with some practice you can easily get the hang of it and the benefits are well worth the extra effort and time. So I have put together a short list of night photography tips that I have picked up along the way to help you out when shooting after dark. Always (always) use a tripod. 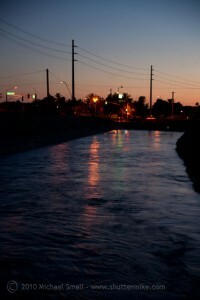 The settings necessary for good night time photography do not allow for hand holding the camera. Use a low ISO (400 or less). This may sound counter-intuitive since a higher ISO is generally used for low light situations. But if you are following tip #1 above you can keep the ISO low and compensate for the low light with aperture and shutter speed thereby keeping noise to a minimum. Set your aperture to f/5.6 – f/8.0. This is obviously going to depend on your exact lighting conditions but this is a good rule of thumb and starting point. Use l0nger shutter speeds. With the low ISO and aperture int he f/8.0 neighborhood you can get the proper exposure through keeping the shutter open longer. Experiment with different shutter speeds to get your ideal exposure. Keep the anti-shake off. When you camera is on a tripod this feature is not necessary and the camera might actually try to compensate for shake that is not there. Use a cable release. The less you touch the camera directly the better. Event he act of pressing the shutter could be enough movement to blur the image. After framing your shot close the eye piece cover to prevent light from getting in. Since you will not have your eye against the eye piece during these long exposures you want to use another method to keep the light out. 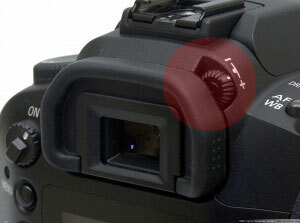 Most cameras have either a cover you can place over the eye piece or a little “door” that closes over it. A quick Google search will turn up everything you need to know about how to photograph fireworks. So rather than reinvent the wheel I have a few quick tips here and then a directory of some of the better fireworks photography sites I have found. 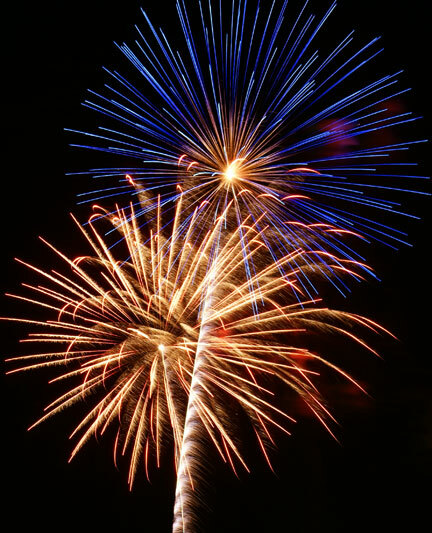 1) Tripod – It goes without saying (although I am saying it), you MUST use a tripod for decent fireworks photographs. With the longer shutter speeds required for night photography the steadiness a tripod provides is essential. 2) Aperture – You might think that since it is dark out you want to open you aperture up to f/5.6 or bigger. 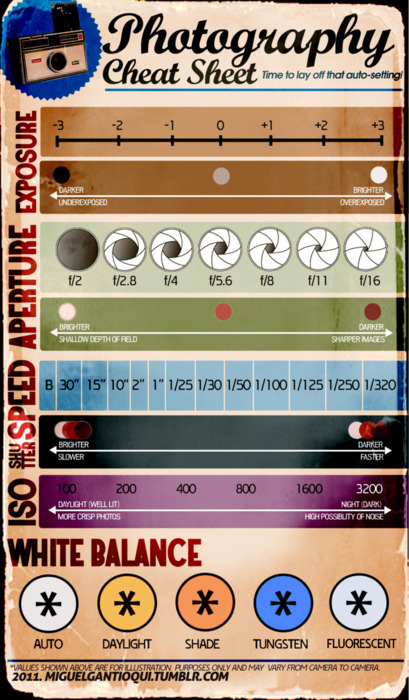 Makes sense, but actually I have found that keeping your aperture around f/8 is ideal. You need to balance the night and the great amount of light that the fireworks give off. Use your aperture priority setting as well so you can determine the f/stop and the camera can set the shutter speed accordingly. 3) ISO – My Sony Alpha 850 can go up to an ISO of 6400. For extreme low light situations that might be perfect. But remember that even in the best cameras the higher the ISO the more noise you are going to get. Since you are already using a tripod you can set your ISO lower and take advantage of the steadiness of the tripod to use longer shutter speeds rather than higher ISO. If possible keep your ISO at around 100-200. 4) Focus – It is not easy to focus on the distant horizon and leave it focused while you wait for the fireworks to explode while on auto focus. One good trick is to let the camera focus while on auto and then while holding that focus switch it to manual so that you basically lock in the focus. 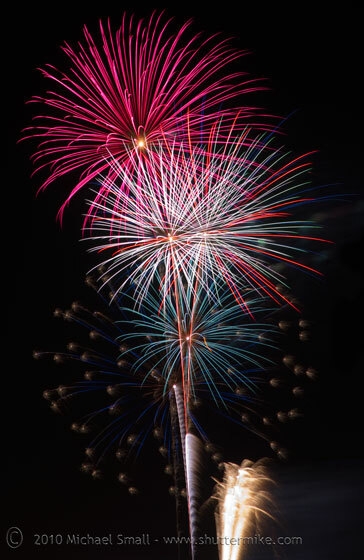 For more great fireworks photography tips here are some additional resources. Like I said, that gets a bit technical for me. But as a photographer I am more interested in the diopter adjustment feature of my camera. Not all cameras have this feature, but on the Sony Alpha 850 that I shoot with it is a small dial to the left of the viewfinder. The dial adjusts the magnification of the optical viewfinder to suit the eyesight of the photographer. That means if you wear glasses you can remove them and adjust the diopter to your vision and then shoot more confidently without your glasses. Of course it cannot correct for your vision 100% but it is a step towards making photographing without your glasses easier. One question I often get from people about my travel photography is “where are the people?” This is particularly true for my photographs of locations that are generally popular tourists destinations. In most of my travel photographs I try very hard to exclude the people because I feel they distract from whatever my true subject may be. Whether photographing Stonehenge in England or Tumacácori Mission in Arizona I feel it can often be a better shot without the crowds of tourists. That may not be the case in every situation or for every photographer. But if you want to cut the people out and focus on the subject in your travel photography here are a few tips I have found work pretty well. 1) Close in on the details – Whether it is the Grand Canyon or an architectural wonder of the world, most every grand scale travel photography subjects have some amazing details that the average tourist misses and are well worth capturing. So get your zoom lens on and focus on the interesting details. By zooming in on these you can’t help but cut out any distractions around it. 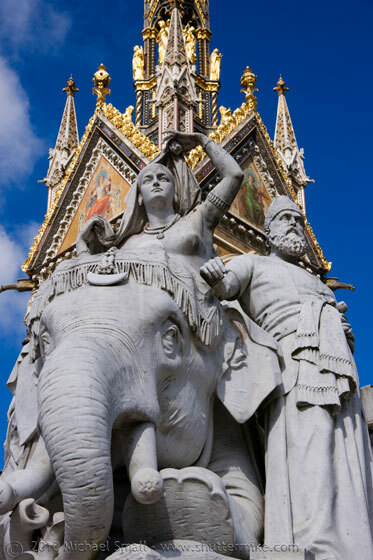 The image of the Prince Albert Memorial in London at the right demonstrates this. 2) Zoom out and dwarf the people – take the opposite approach of tip number 1 and use your wide angle lens to get the entire subject. This can have the effect of dwarfing any people that may be in your shot making them almost unnoticed because the real focus of the photograph dominates the image. 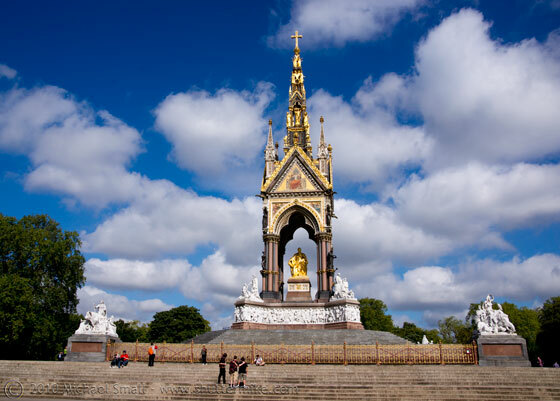 The image at the left is the same subject as the example in tip number 1, but this time using a wide angle lens makes the people on the steps appear tiny and inconsequential to the memorial monument as a whole. 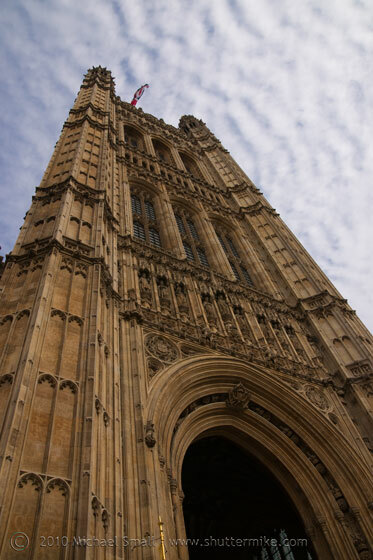 3) Have patience – This is a good tip for photography in general, but it particularly applies when trying to capture a travel photography of a busy tourist site without the tourists themselves distracting from the subject. Sometimes you have to scope out your ideal angle and location and then just wait for the crowds to part. Get your shot all set up and be ready to click the shutter once there is a brief clearing. Even at the busiest of tourist spots you can generally count on an occasional opening in the crowds to snap your image. 4) Search out angles and perspectives that allow you to avoid people – This one is pretty easy to accomplish. It just takes a little leg work to seek out a perspective that allows you to capture your subject well without including any distractions. 5) Resort to PhotoShop – When all else fails and you just can’t seem to eliminate the people the magic of PhotoShop can always lend a hand. A little cropping here and spot healing there can often do the trick if you accidentally got a stray head or arm in the shot. It is a lot harder to do with full crowds, but if you have the skills edit away. 6) Embrace the crowds and include them in your shot – Finally, people in the shot are not always a bad thing. They contribute something to the story of the image and can set the scene. So you do not have to work tirelessly to remove them from every shot. In some instances it is not possible to remove 0r work around every person. 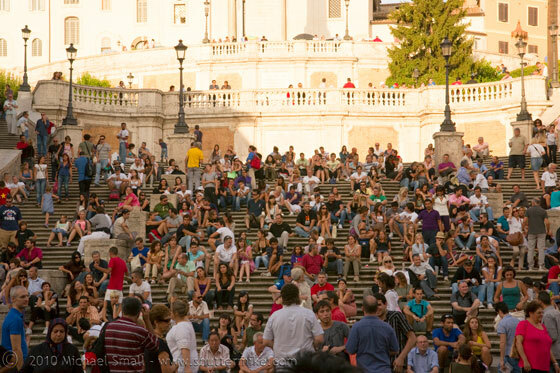 For example, the Spanish Steps in Rome (at the left) would not be the same without the people. The steps are all about the crowds that gather so you want to include them in an instance like this. It is the first of July, that means we are only a few days away from photographing fireworks. I do not have a lot of experience in this area to offer solid first hand advice on how to capture the best fireworks photographs. But I do have a few pieces of advice from my fireworks photography outing last 4th of July. I have also complied what I feel are some great resources out on the Internet to help guide you through the process. 2. A remote shutter release cable can help significantly as well. It allows you to release the shutter without touching the camera thereby reducing camera shake and blur. 3. Location is key. It really helps to scout out the area where the show is going to be the day before to find a spot where you will get the best vantage point. 4. Read up on the best settings to use for photographing fireworks ahead of time so you can limit your experimentation during the show when time is limited. 5. Above all else, have fun with it. 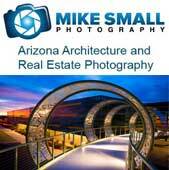 Digital Photography School – This is a great resource for all things photography related. Their How to Photography Fireworks guide is one of the best and well worth taking a few minutes to read. Photographyreview.com – The Fireworks Photography Guide from photographyreview.com goes more into the technical aspects of getting the best shot. Even if you are not familiar with all the technical aspects of photography this is a good read. No time like the present to start learning anyway. Canon – You don’t have to be using a Canon camera to take advantage of their advice. The Canon Digital Learning Center’s Quick Tips: Photographing Fireworks article includes a helpful section on how to best compose your fireworks shots. Does the equipment make then photographer? I do not believe that fancy equipment, in and of itself, makes someone a better photographer. The ability to use that equipment and an artistic eye are what make good photographs. However, there are some pieces of equipment that really can make all the difference between an adequate photograph and a good or great photograph. The tripod is one such piece of equipment. My case in point is these two photographs. They were both taken at about the same time of day (although on different days) from about the same vantage point. The one on the left was taken with a hand held camera and the one on the right was taken with a tripod mounted camera. The biggest issue with hand held shots at these light levels is camera shake. Even the Sony Alpha DSLR’s Steady Shot feature is not going to be able to correct for the shake that can occur at the shutter speeds necessary to accomplish this image. So without the tripod (left) I needed to get a long enough shutter speed to capture the image in low light while not making it so long that all I got was a blur from movement of the camera. In order to decrease the length of time I needed the shutter open I could have used a larger aperture (smaller f-stop number) and/or increased my ISO. For the image on the left, without the tripod, I used the widest aperture available on the lens I was using (a prime 50 mm), which was f/1.7 along with an ISO of 800. This allowed me to use a shutter speed of 1/10 second and get a good exposure. But 1/10 of a second is really still too slow for hand held photography. Anything longer than 1/60 of a second is likely to cause you problems. If I had bumped up my ISO any higher (the Sony Alpha 850 can go up to 6400) the noise would have been distracting. Even at 800 ISO at larger sizes the noise in this image is noticeable. So that takes us to the image on the right, the one taken with the camera mounted on a tripod. The sure footed-ness of the tripod allows me to take camera shake out of the equation. So now I have more options for a more crisp image with less noise. For this image I used an aperture of f/5.0, an ISO of 200 (less noisy) and a shutter speed of .8 seconds. 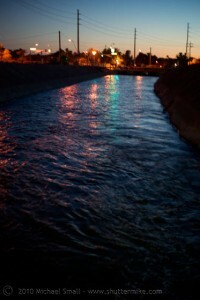 This combination of settings resulted in a photograph that, when viewed at high resolution, is cleaner and far less blurred. So although the tripod alone was not responsible for these images. The right equipment combined with a little camera know-how and a bit of an artistic eye can combine together for much better photography.